You are currently browsing the tag archive for the ‘politics’ tag. As pictures can convey more than blah-blah-blah words, here’s a graphic to go along with my last entry on government balance of power and economic downturns. 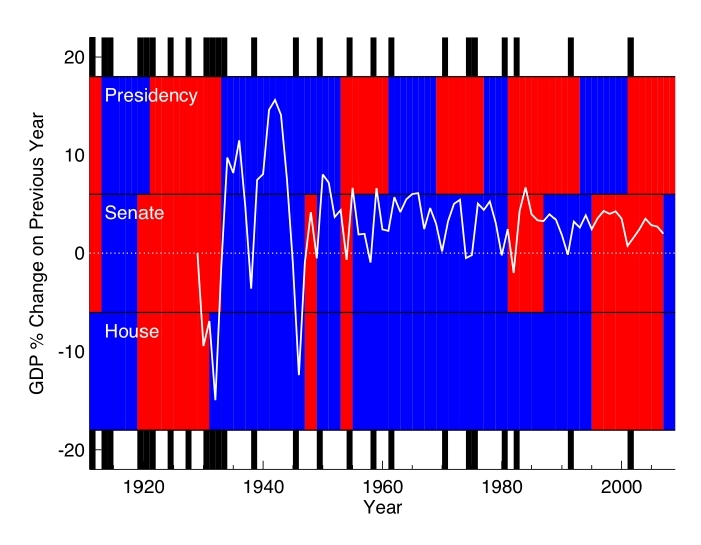 For the period 1910-2009, I’ve plotted the change in real GDP per year (from 1930 to 2007), overlaying which party had the balance in power in the Presidency, Senate and House where the usual blue = Democrat, red = Republican color scheme applies. The outer black bands indicate the 19 contraction periods (downturns) during the time shown as identified by the National Bureau of Economic Research. Major recessions/depressions occur when the change in GDP gets close to zero (there are about 7 of these after 1950). The period between 1930 and 1945 was definitely a roller-coaster, and the economy (at least GDP) has been a lot more stable since 1950. I have failed to indicate any important world events (e.g., World War II, Vietnam War) that could have had a significant impact on the turn in US GDP, so please take care in your interpretations. Again, I don’t draw any strong conclusions (i.e. blame) from this, although frankly I was surprised at how rarely the Republicans have held power over the executive and legislative branches over the past century (i.e., there is a lot of blue up there). 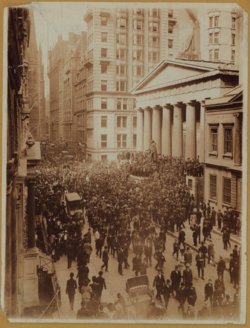 Do Republicans Cause Economic Depression? I was watching tonight’s 60-minute spot on McCain & Obama, and started to reflect on the extensive coverage (and rhetoric) on the status of our economy and its effect (or blame) on politics. One argument I hear over and over when someone is defending their own party (or damning another) during an economic crises is that the it is the result of the previous administration(s) and not the current one, or that Congress is to blame and not the President (or vice-versa), etc. So I thought I’d do a little exercise to see for myself. The exercise was as follows: I looked up the dates of the 12 “sharp” recessions and depressions over the past century (including the current crisis), ignoring so-called “mild recessions” (such as the 1991-1992 downturn), as classified by Geoffrey Moore (note that the National Bureau of Economic Research lists 20 “downturns” since 1907, but not all of these were severe). I then found what party was in power in either the Presidency or Congress in the preceding decade leading up to the downturn. Determining what president was in power was a cinch, but for the Congressional power balance I found the information I needed in the Recapitulation tables from the Office of the Clerk of the House of Representatives (what a great resource – great job clerks!). I assumed that the majority party was “in control” for a given Congressional cycle (admittedly an arguable standpoint). I determined the balance of power in any decade as the percentage of years that a given party was either president or in control of either house of Congress. I also looked up some information on the severity of each downturn and some commonly ascribed (although not necessarily accurate) underlying causes. Immediately below I list my data, but you might want to skip ahead to the Analysis to see what my conclusions are.